Page Updated:- Sunday, 03 March, 2019. Above postcard circa 1910, kindly sent by Garth Wyver. Above picture taken from Google maps, July 2009. 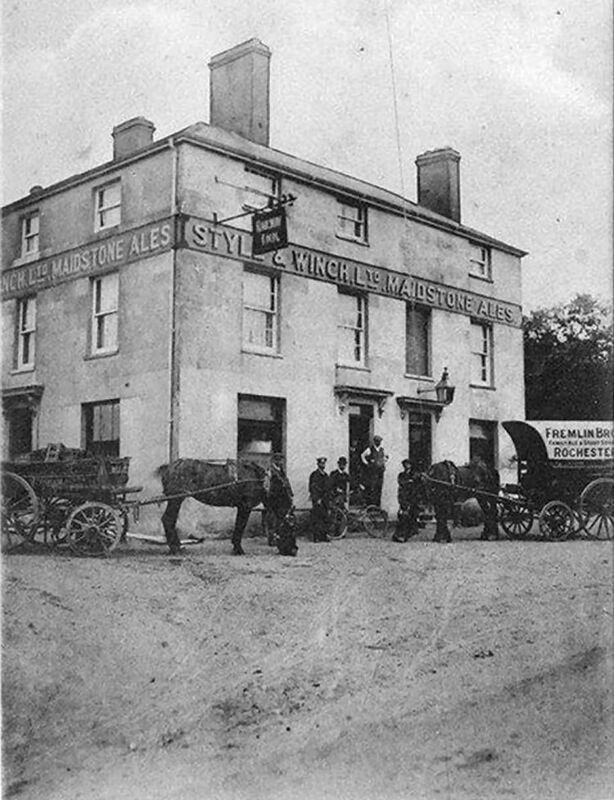 Originally built as a farmhouse, but became a pub in 1858 with the arrival of the railway. Originally a Barclay's pub, then Courage. At one time it operated as an Indian restaurant, but today back as a pub and Freehouse. Inside there are 2 bars, with open fireplace that has an electric fire in it. From the Maidstone Telegraph, Rochester and Chatham Gazette, Saturday 17 March, 1860. Price 1d. Thomas Williams and John McCarthy were charged with having uttered two counterfeit half-crowns, at Minster in Sheppey. Mr. Deeds prosecuted and Mr. Sharp defended the prisoner Williams. McCarthy was undefended. John Thompson, a smith, resided at Minster, deposed that the prisoner McCarthy followed him into a beer-house and purchased some beer for the payment of which he tendered half a crown. On leaving the beer-house he went towards the other prisoner Williams. Mary Gardener deposed to the prisoner coming to her house on the day in question. She served him with a glass of ale. The prisoner gave her a half-crown and witness gave him 2s. 4d. change. She afterwards found out that the half-crown was counterfeit. Alfred Town, residing at Eastchurch, deposed to McCarthy coming to his master's shop on the 21st February and purchasing some tobacco. He tendered half-a-crown in payment, which was a bad one. The prisoner Williams was standing a short distance off in the road. John Thomas Town, a brother of the last witness deposed that he was in the shop when McCarthy entered. He received the half-crown from him and gave it to his brother. 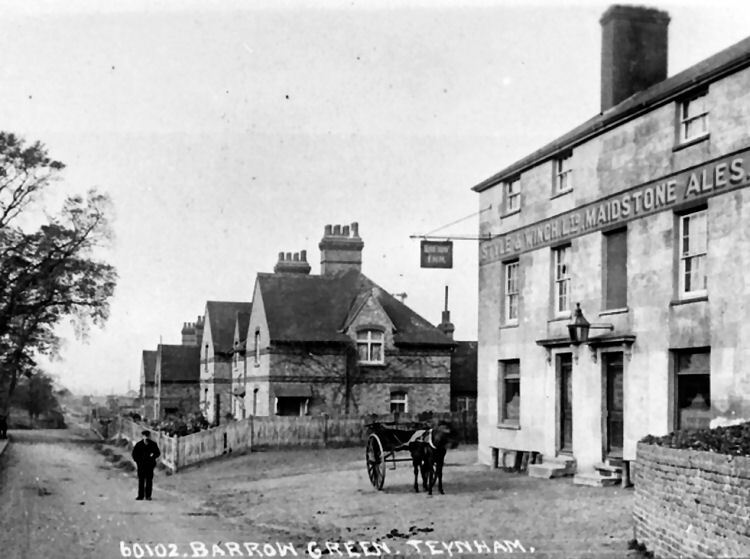 William Stone, who keeps the “Railway Tavern” at Teynham, deposed that on 21st February the prisoner Williams came into his house asked for a light and a glass of rum. Prisoner gave him half-a-crown, and on placing it in the till he felt that it was smooth. Witness then gave him the half-crown back again. Prisoner then gave witness a sovereign, which upon examination, he believed also to be counterfeit and he refused to take it. The prisoner said if the money was bad he had taken it at the railway station, and asked witness whether he though they would return him good money. The prisoner then went towards the station and witness followed. On asking him if he had seen any one the prisoner said there was no one in the office. Witness then said he would go to the station with him. Shortly after their arrival, the station-master entered, and in answer to questions denied having given the prisoner any money. Prisoner then said it was not that station, but he meant one in London. Mr. Green, the station master at Tenyham, said that on the evening in question the prisoner knocked at his door and enquired the time the next train would start for London. Witness told him there were no more for London that evening, and shut the door. P.C. Day, at Eastbridge, produced a bad half-crown that he had received from a former witness. Mr. J. Bartlett, silversmith, of Maidstone, deposed to the two half-crowns produced being counterfeit. P.C. Baines deposed to seeing the prisoner Williams searching at Sittingbourne, when some gold, silver and copper were found on his person, all good money. This was the case for the prosecution, and the learned counsel having replied on behalf of Williams, his Lordship summed up, and the prisoners were found guilty and each sentenced to twelve months' hard labour. From the Kentish Chronicle, 12 January, 1861. THE FATAL ACCIDENT on the LONDON, CHATHAM, and DOVER RAILWAY. The enquiry into the circumstances attending the deaths of Edward Ogden and James Plaisted (stokers), and John Maddison (engine driver), in the service of the above railway, who lost their lives by the frightful accident which occurred near this station on Saturday night last, was proceeded with before Mr. Thomas Hills, one of the coroners for this division of the county of Kent, at the "Railway Inn." Amongst those present were Mr. Hilton, Mr. Cobb, and Mr. Lake, directors; Mr Finnigan, the traffic manager; Mr. Martley, locomotive superintendent; Mr. L Cubitt, C.E., the consulting engineer of the line; and other officials of the company. Prior to holding the inquest the coroner and jury inspected the engine and tender and the carriages forming the train to which the accident occurred. It will be seen from the evidence that the engine left the rails and ran into a field by the side of the line, and the fore wheels were in advance of the engine some ten feet, they having left the engine in consequence of a fracture of one of the horn plates, which caused the accident. The fore wheels had been replaced, and, with the exception of a serious injury near the foot plate, little appeared to show the frightful damage which had been done to the machine. The most remarkable fact in connection with the accident was the condition of a first class carriage, the whole of the sides of the carriage, and the roof, being entirely swept away, one of the upright ends only remaining. The only passenger in this carriage was a Mr. Taylor, one of the clerks of the company, who states that he felt the shock consequent upon the fracture of the horn plate, and that his only recollection was that he crept from under the roof of the carriage, which had been thrown some feet in advance. John Goodyear, the first witness examined, deposed that he was a guard, and had been a guard on the line since the extension was opened. The deceased Ogden was a stoker. The train that met with the accident was the 7.45 out of London, on Saturday. It consisted of one first-class carriage, two second-class, one third-class carriage, and a break. They proceeded all right until approaching the distance signal at Teynham. It was then about ten p.m. The break van was in the hinder part of the train. The first thing he felt was the carriage jumping on the line. He put the break on, and he recollected nothing further. When he came to himself he was lying in the six-feet space. He could tell them nothing further. He did not see Ogden after they left Chatham. The name of the engine-driver was John Maddison. James Plaisted was the fireman. He saw them both safe at Sittingbourne. George Birch, of Faversham, deposed that he was a porter on the line. He was a passenger in the train on Saturday night. He was not in the carriage next the break, but the next one to it. The accident happened somewhere about the distance signal. As they were approaching the station the carriage gave a jerk and turned partly over. He got out pretty quick, and saw the engine on its side near the break. The carriages were all turned over except the one he was in. He also saw one of the bodies on the ground. He went away immediately for the medical men. The accident occurred instantly, and gave no previous notice. The next witness examined was Patrick May:— He said he was a practical engineer. He was in the train on Saturday night in a third-class carriage, next to the break. As they approached the station he perceived that the carriages were oscillating. He was alone in the carriage, and after running a short distance it partly turned over. He got out and could not find anybody. He went round the field, looked into the carriages, called out for the guard, but could not find him. He at length found a little man, a porter, and asked him if he had seen any one. The man replied no; and witness then exclaimed, "Then everybody is killed except me and you." Shortly after the guard and the station-master came, and after a search they found the bodies of the unfortunate sufferers. The Rev. Mr. Kiddle deposed that he was a second-class passenger by the train from London. As they approached Teynham he heard a sound as if the engine was scraping up ballast, the carriage shook violently, and he was thrown from his hold of the window. The carriage was all smashed up. Mr. Williams, the station-master at Teynham, deposed that three minutes after ten on Saturday night he was watching for the train. He saw the train coming when he suddenly missed the head light of the engine, and he saw a cloud of steam. He went down to the spot and found that the tender had left the line; the engine was in an adjoining field; a third-class carriage was crushed on the up line, one of the first-class carriages was lying in a ditch, and another was across both the lines, both very much damaged. The guard, having the break well applied, held the van and the second-class carriages up. He found the engine driver (since dead) alive. The driver did not think that he was much hurt. On further search found the other bodies, and took the necessary precautions to prevent further accident. He examined the scene of the accident. A piece of iron, called the horn plate, of one of the fore wheels of the engine was put into his hands, which he produced in court. The effect of the breaking of the horn plate would be to deprive the fore wheels of all support. The rails were not turned up, and the road stood very well, none of them displaced. The driver, before his death, said "He felt a sudden jerk, and he remembered no more." By a juror:— How far was the horn plate from the engine when it was found? Witness:— About 40 or 50 yards. James Grant, a plate layer, deposed to the finding of the horn plate. Dr. Church examined, deposed to finding the deceased men; two of them were dead, and the third, the engine-driver, Maddison, lingered until three o'clock on Monday morning. Mr. Martley, the locomotive superintendent of the line, said he had seen and examined the engine and carriages forming the train in question. The piece of iron in court had been brought under his notice; it formed the leading horn of the left hand frame of the engine. It kept the wheels in their place, and the effect of it being broken would be to let the wheels come under the engine. The breaking and absence of the horn plate caused the accident. The greater portion of the fracture on the horn plate was in good condition, but the chuck of it was defective. The iron showed faults, and faults no doubt had existed in the iron before the breakage. The faults might be old, or they might be new, but they would not materially effect the accident. The iron was not of first-class quality, but still it must have taken a sharp blow to have caused the fracture. He could not conceive how the accident happened. He could not find any reason that caused the plate to break, but any obstruction on the line would be likely to cause it. The guard-irons of the engine were about an inch and a quarter from the top of the rails. By the Coroner:— You have raised a difficulty which is not likely to be got over, as it must be a very slight article that could escape the guard irons of the engine. Examination continued:— He had examined the line and found the condition of the road was good. No doubt the frost would have a greater effect upon the iron of the horn plate than upon iron of a tougher description. Mr. Cubitt, the consulting engineer of the company, said the iron of the horn plate was by no means of a satisfactory description. It mast have taken a sharp blow to cause the fracture; but he had no evidence to prove that such a blow had been given. There were several other fractures in the iron of old date. Mr. Aveling, engineer, said the iron was not good, but he had seen worse. The old fractures in the iron no doubt caused the accident. Mr. Martley said he had omitted to mention that he had visited the engine-driver on Sunday. The deceased stated that before leaving London he had examined all the wheels and axles, and that he found them all right and no flaw in them. No more witnesses were examined. The Coroner then summed up, and the Jury retired; and after a short absence returned a verdict of Accidental Death, caused by the breaking of the horn plate, but the cause of which is not proved. From the Kentish Chronicle, 3 January, 1863. From the Whitstable Times and Herne Bay Herald. 23 November 1867. Price 1d. Robert Collins, 38, of Teynham, and Edward Collins, 11, his son, were charged with stealing potatoes, value 4d., the property of Frederick Honeyball, at Teynham, on the 13th November. The younger prisoner was met by Police-constable Ling, between six and seven o'clock on the evening in question, carrying a basket containing about a gallon and a half of potatoes. He told the constable he bought them at Mr. Creeds, the “Railway Inn." Ling let the boy go, and made inquiries, and found that this was untrue. Next morning Ling and the prosecutor found that a clamp in the field had been disturbed, and about a gallon and a half of potatoes taken away. Ling afterwards met the boy, who told him that his father gave him his basket when he came home from work, which the boy was taking home when stopped. Both prisoners were subsequently apprehended. They were remanded till the next petty sessions. Even after the prisoners were apprehended some other thief stole a quantity from the same clamp. Teynham Goal-Running Club: Headquarters, Railway Inn, Lower Road, Teynham; Ground, Newgardens. This club since its formation in 1900 has each year won the champion bannerette in a competition known as the Faversham and District Goal-Running Competition, which, is open to East Kent. They have also won four silver cups and two other banners at Maidstone and other places, and are generally considered to be the finest exponents of the game in the county. President, Dr. P. D. Selby; Chair­man, Mr. W. Trigg; Committee, Messrs. J. Kadwell, F. Austin, C. Sattin, J.Hopkins, H. Radley, W. Tumber, G. Gilbert, J. Sattin, and A. Boorman; Captain, T. Pilcher; Vice-Captain, A. Boorman; Treasurer, E. Perkess. Secretary, F. Austin. Teynham Football Club: Headquarters, Railway Inn; Ground, Newgardens. 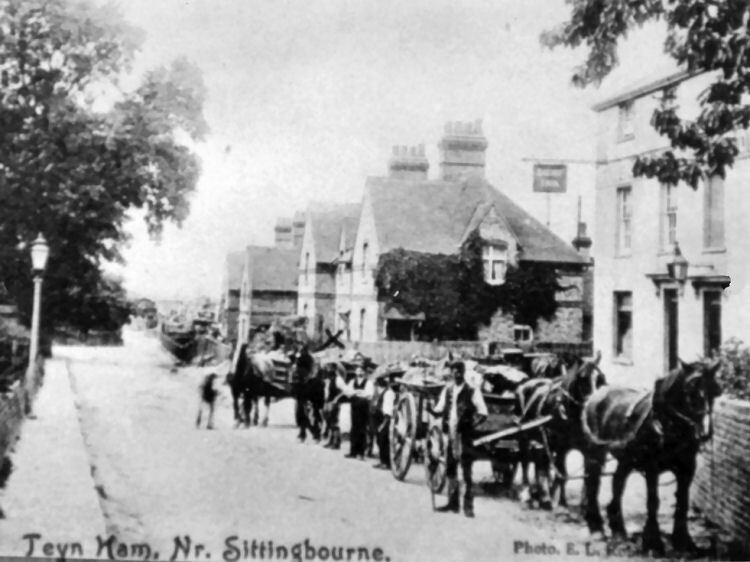 Members of the Sittingbourne and District League (second divi­sion). Secretary, Mr. W. Winterton, Teynham. Railway Inn Hand-in-Hand Benefit Club: Held at the Railway Tavern, Lower Road, Teynham. Benefits in cases of sickness and death, with share-out in December. Membership, about fifty persons. Club nights, every fourth Monday. Secretary, H. Lawrence, Barrow Green, Teynham. Railway Tavern Death Club: Headquarters, Railway Tavern, Lower Road, Teynham. Benefits in case of death of members, their wives, or children. Membership, about 150 persons. Secretary, P. Baker, Teynham. From the https://www.kentonline.co.uk By Hayley Robinson, 25 January 2014. Teynham pub the Railway Tavern could be transformed into a house because of a lack of trade. Time looks set to be called on a village pub. 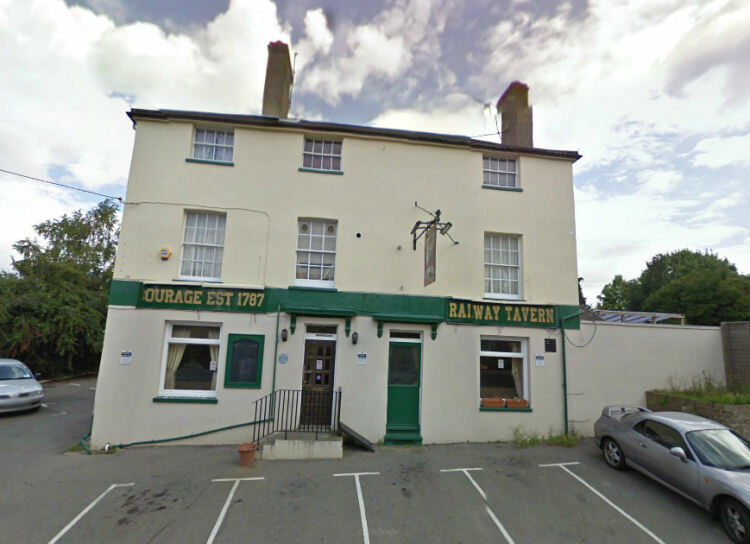 Landlord Hari Johnston has applied for planning permission to convert the "Railway Tavern" in The Crescent, Teynham, into a house as it is “no longer commercially viable”. The 49-year-old and his wife, Katherine, currently live above the watering hole, which they have owned since August 2009. 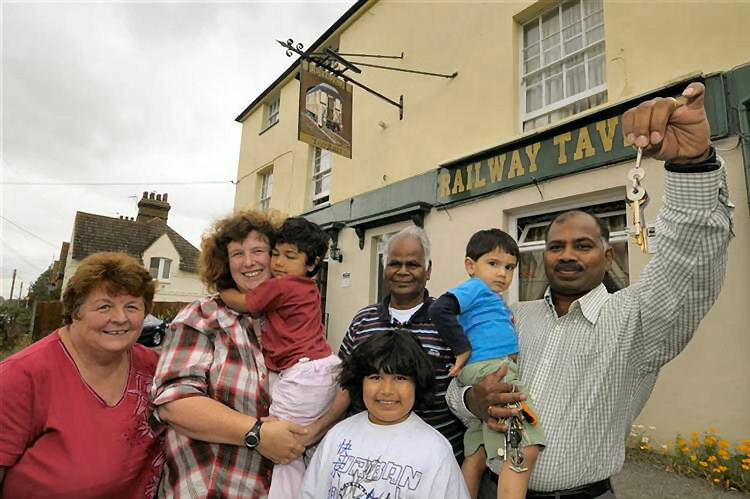 Hari and Katherine Johnston and family outside the Railway Tavern after buying the pub from Enterprise Inns in 2009. There were fears the pub would close prior to the couple taking it over, as former owner Enterprise Inns had put restrictions on its sale that would, in effect, have resulted in it becoming a restaurant. The company lifted the restrictions after more than 600 villagers signed a petition. Over the years, the villagers’ support for the boozer has dwindled, and it now only opens from 4pm to 7pm, Tuesday to Thursday, 4pm to 9pm on Friday, 3pm to 10pm on Saturday, and midday to 6pm on Sunday. The loss of trade has resulted in Mr Johnston losing £35,000 of his own money. In a letter supporting his application to Swale council, Mr Johnston, who also runs the village shop Verni Mini Market, said: “In an effort to reverse the downward trend in turnover we diversified and opened a Indian and Sri Lankan restaurant and take-away service. This had to close through lack of patronage. “There is a downward trend towards… drinking in public houses mainly due to the cost. “In an effort to reduce overhead costs, we have reviewed our opening hours to reflect customer demand. More often than not, we close before the stated closing time due to lack of customers. See the planning application in full at www.ukplanning.co.uk and search for reference number SW/13/1556. Planning permission was given on the 9th November 2015 to change its use to residential.